These sort of conventions are increasingly being used as a platform to engage with fans and early adaptors to generate buzz and gauge the early reaction for core audiences to titles. Now in its third year Movie-Con has organically grown into a 3, well a 3 and a half days affair. The 300 or so Conner’s can expect an opening party, trailers, early footage, preview screenings, talks from the people behind the films and to interact with fellow film lovers. To understand the utter awesomeness last year of Movie-Con amongst the early footage, previews (Funny People, Inglourious Basterds', The Hurt Locker, The Imaginarium of Dr Parnassus) amongst other notables both Robert Downey Junior and Guy Ritchie popped in to talk about Sherlock Holmes and Iron Man. You can read my coverage of last year’s Movie-Con here! With many big studios increasingly recognising that the in-roads to International Markets are opening up at a grass roots level – UK fans are getting more love and attention. The US still gets first dibs on the bulk of the pie, but we are increasingly seeing some of the good stuff earlier as well a lot of the home-grown stuff before the US. As examples of this; we got to see a teaser trailer for Danny Boyle’s awesome looking 127 Hours, footage from the future classic Brighton Rock, and exclusives like confirmation that Karl Urban is too be Judge Dredd and that Jason Flyming will be Azazel in Matthew Vaughn's upcoming X-Men: First Class. Movie-Con is also a platform for smaller independent titles to be introduced to potential audiences last year we got to see bits and hear about the surreal Bunny and the Bull this year we were introduced to the just as mad but charming Belgian A Town called Panic. Initially I was going to blog each day but found taking notes detracting from the main reason I was there (to enjoy and engage) as well as Empire have a blow by blow report of events up at the end of each day over here! Which actually frees me up to give my commentary of the proceedings rather than spend too much time on the details of what happened. Danny Boyle and Producer Christian Colson opened up Movie-Con by showing us a teaser trailer for 127 Hours. In fact the trailer’s colour grading was only completed earlier in the day so that it could be seen at Movie-Con. Empire then told us that 127 Hours will be closing the London Film Festival this year. It was at about this point it dawned on me how great Movie-Con III was going to be. 127 Hours is the true story of mountain climber Aron Ralston's (James Franco) remarkable adventure to save himself after a fallen boulder crashes on his arm and traps him in an isolated canyon in Utah. Over the next five days Ralston examines his life and survives the elements to finally discover he has the courage and the wherewithal to extricate himself by any means necessary, scale a 65 foot wall and hike over eight miles before he is finally rescued. Throughout his journey, Ralston recalls friends, lovers (Clemence Poesy), family, and the two hikers (Amber Tamblyn and Kate Mara) he met before his accident. Will they be the last two people he ever had the chance to meet? - Fox Searchlight Pictures. The teaser trailer is beautifully shot as we have come to expect from Danny Boyle it’s; bold, colourful, compelling, introduces us to a new world and incredibly well shot. It shows James Franco as a bold outdoors man mountain biking, he is clearly master of his domain, loving life. He meets 2 girls on a trail and takes them off the trodden path and more into Beach territory (we see them find there way into a crystal blue pool). He then jogs off on further adventures where it all goes horribly wrong. James Franco shines and women will want to be with him and men will want to be him. I loved the trailer and I can’t wait to see 127 Hours. Danny Boyle and Christian Colson then went onto do a QA session for the 'Conners. Look the teaser trailer was great but the in all honesty the real draw was been able to listen to Danny Boyle talk, he was awe inspiring, incredibly engaging and inspirational talker. I would pay the price of film admission just to hear him talk. He had the crowd on the edges of their seats waiting on his next line. The incident happened in 2003, he read the book in 2005 and has been wanting to make the film since then, he met with Aaron but only got the go ahead after Slumdog Millionaire and a scecond meeting. The film shoot and post production was compressed, shooting started on March 15 and it will Premiere on September 12. The measurement of success of 127 Hours is: will the audience root for Aaron to do the unthinkable? I’m paraphrasing to avoid possible spoilers. Audience Member: Hello, I’m from (same town as Boyle) and I was wondering of you had any advice for film-makers starting out? This could be considered by many to be a fairly lame and generic question (there was actually an audible sigh, when he asked). But bear in mind that this might be the guys only opportunity to ask his hero (or someone he greatly respects) a question, whose answer may make the world of difference to him. Work with your mates, peers, people whose opinions you respect. Being the opening night, every one still finding their feet at Movie-Con and everything happening quickly So the only part of Danny Boyle’s huge personality that may not have come across is just how done to how down earth he is. Hammer & Tongs present: A Town Called Panic. I didn’t know anything about A Town called Panic - apart from that it was recently screened as part of Film4’s Outdoor Summer Screen Festival at Somerset House on a double bill with Team America. A Town Called Panic is being distributed by Optimum in the UK. So they asked Filmmakers Nick Goldsmith and Garth Jennings the duo collectively known as Hammer & Tongs to please help champion this little gem. They thought it was a bit strange that they were asked to be involved with a film they had not actually made but after screening the film they were in. I should mention that Nick Goldsmith bears an incredible likeness to a suave bearded Vin Diesel that is not actually Vin Diesel. 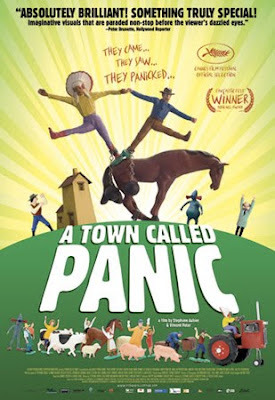 We got to see the trailer for A Town Called Panic which was absolutely mad. They then showed us a scene from the film – madder, another clip even madder followed by a hilarious interview with the genius Russian animator Pavel Scratchanitch of A Town Called Panic who looked suspiciously like a scruffy, unkempt, accented, reeking of garlic Adam Buxton. The interview included clips from two of his earlier works; a re-imagineering of Spongebob Squarepants Black Rock No Pants, literally a Black Rock with no pants and Pavemon a black & white, 60s French existential version of Pokemon. Keep an eye online for this it’s hilarious. In between getting drunk Pavel’s offered advice on shaping A Town Called Panic that included;’ “no, no, it needs to be weirder” and “that makes sense, take it out”. I was left with the distinct impression that A Town Called Panic is surreal, fresh, original and for some reason very nostalgic. An animated Monty Python on acid with subtitles. Below is some recently discovered footage of animator Pavel Scratchanitch. One of this year’s heavy hitters #Oscars Never Let Me Go is based on a 2005 novel shortlisted for the Booker Prize by Japanese-born British author Kazuo. It is much loved and expectations are high for Never Let Me Go. It was announced that Never Let Me Go will be opening the 2010 London Film Festival. Never Let Me Go is an upcoming dystopian drama film based on a novel of the same name written by Kazuo Ishiguro. As children, Ruth, Kathy and Tommy, spend their childhood at a seemingly idyllic English boarding school. As they grow into young adults, they find that they have to come to terms with the strength of the love they feel for each other, while preparing themselves for the haunting reality that awaits them. It is directed by Mark Romanek and stars Keira Knightley, Carey Mulligan and Andrew Garfield. Alex Garland wrote the screenplay for the film. The film is produced by DNA Films and Film4. It will premiere at the 2010 Toronto International Film Festival. Also it will open the 54th London Film Festival. It will be distributed theatrically by Fox Searchlight Pictures in the United States on 15 September 2010. In the United Kingdom it will be distributed theatrically on 14 January 2011, - Twentieth Century Fox. 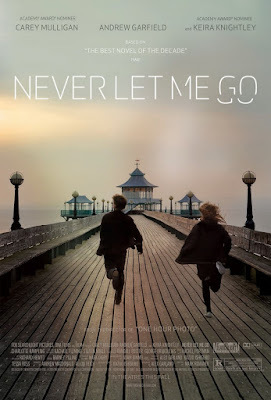 I haven’t read the book and did not know much about Never Let Me Go apart from some of the cast that were in it, the acclaimed Mark Romanek was shooting it and that it was being filmed outside of London in a big house. Much of this information came to me serendipitously a long while back when my fiancés birthday party was coincidentally at the same venue as the wrap party for London Boulevard in attendance were Colin Farrell, Keira Knightley, Anna Friel, David Thewliss and Stephen Graham. There were probably loads more cast and team around but I was tipsy and at the best of times terrible identifying film people. The films Producers Andrew Macdonald (A personal hero of mine) and Allon Reich gave a short QA after we got to see the Trailer. I have to say that I went from not knowing anything about Never Let Me Go to getting a fairly good idea of what the plotline was and the central theme around the title. Thankfully I don’t know how it all ends but I’m hoping the film has a rich tapestry that I can revel in getting there. OK! Although there was no presentation for Judge Dredd and it probably doesn’t deserve its own little section like the films that were presented - But I’m a fan and both Andrew Macdonald (A personal hero of mine) and Allon Reich gave enough information to warrant that Dredd gets its own section. Recently Duncan Jones let it out of the bag that he had passed on the chance to direct Judge Dredd - which was sad news for me as Jones is a life long fan of Judge Dredd (& Rogue Trooper) and a brilliant filmmaker so you know his Dredd would have been somewhere between great and awesome. Jones has said that the script that he saw was "strong" but his vision for Dredd was different. Regarding their vision for Judge Dredd – “Dredd is a fantastic comic that they messed up 20 years ago. They built a huge city (set), inhabited it and tried to make the film for everyone, when it’s not for everyone. They cast a big star, paying a lot money so they thought let’s show his face. We are making ours for a similar price to D9. Ours is an R-Rated gritty story of Dredd in a Mega City. The helmet is not coming off. He will hit people and people will hit him. The bike will feel real. There has been a change guns. They weren't taking very seriously but - they now they are. We have Karl Urban.” This was in fact confirmation that Karl Urban had indeed been cast as Judge Dredd. Shooting starts in December in Johannesburg (actually Gauteng) South Africa. It will be directed by Pete Travis (Vantage Point) and produced by the same guys behind D9. The script for Judge Dredd was developed by Alex Garland (long time Boyle collaborator and screenplay writer of Never Let Me Go). It will be an original story not based on one single comic story arc. John Wagner (one of the original Judge Dredd writers) has been involved and likes where it is going. Wasted opportunity Andrew Macdonald is Producing The Sweeney. It would have been great to get some insight from him about it. Is it still on? What of the cast? ;Ray Winstone/Daniel Craig/Ewan McGregor/ Orlando Bloom/ Tom Hardy, that’s too many names. After a short break we were treated to a preview of the biggest team up film of all time, The Expendables a week before general release. I was lucky enough to be invited the UK Premiere last week, needed some time to decompress after a long week and get my bespoke T-shirts for the Movie-Con T-Shirt Competition ready so I made my way home. At some point I'll get a review of The Expendables up. I was looking forward to hearing remixed versions of Blade Runner and THX 1138 especially since James Lavelle from Unkle had been part of the Dark Fibre collective at one point. As well as the party thrown by Jamesons for Movie-Conners, but I needed to make sure my T-shirt was perfect for Movie–Con III Day 2. I leave you with some clips from Dark Fibre's score. Over at Empire's Movie-Con website.